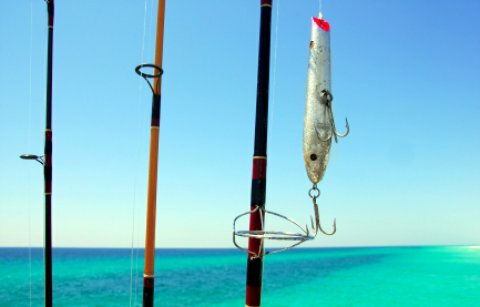 Pompano Beach Florida is the Sport Fishing Capital of the World. Don’t forget your fishing gear, (or rent it when you get here). Pompano (the fish) can be caught right here in Pompano waters so the beach is aptly named. Actually, you can catch over 400 species of fish here (if you are good enough). Are you up to the challenge? Our fish don't think so. Pompano Beach Municipal Pier never closes and is almost always occupied by fishing enthusiasts, especially those with insomnia. Others are just enjoying a relaxing stroll along a remarkable beach. I meditate as I walk along. Very relaxing. Just north of Ft. Lauderdale, recently renovated Pompano Beach is quickly becoming a favorite of locals and returning visitors. Relax on the soft white sand and work on your tan, or dive into the beautiful blue-green water and enjoy some of the most colorful fish in the area. Shop for the best bargains and coolest souvenirs at the Festival Flea Market and Antique Mall which is a great indoor flea market providing lots of great deals and unique items. Close your eyes, unwind and be taken away from the stressors of every day life at Massage Cabana. Work on your tan and just enjoy a nice beach that maintains a secluded and beachy town atmosphere but still has enough shopping and eating to keep you happy. By beachy, we mean come as your are. Kids of most ages: Have your own sand castle building competition or see who can ride the most waves on your boogie boards! Eating: For a high-class stay, try Wyndham Santa Barbara where all of the rooms are designed like little condominiums. The hotel is relatively affordable and provides incredible beach and poolside views. For a family friendly, affordable choice, stay in the Surfside Resort in Pompano Beach Florida.